The next C20 Southern event will be a trip to Weymouth on 6th October. Final details are still being worked out but the itinerary will include the Riviera Hotel, the Harvester in Bowleaze Cove, Weymouth Pier, bandstand and the Pavilion Theatre in the morning and Portland House in the afternoon (National Trust – bring your card or pay £5 on the day). We will meet at the Riviera Hotel at 10.15am. It would be much appreciated if anyone coming by car and willing to offer lifts (including to and from station) could get in touch with me. For those coming by rail, we suggest taking the 8.00/8.19am from Southampton arriving at 9.40/10.11am in Weymouth. We should be able to offer lifts from the station. The charge for this event is £5 (plus the National Trust entry fee for non-members – see above). Please email paulinemousley@btinternet.com to book. Final details will be issued in late September. The C20 Southern group was formed in late 2014 and covers Dorset, Hampshire, Sussex, Wiltshire. 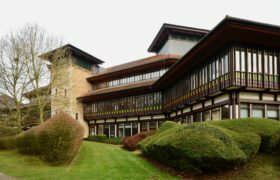 Notable buildings in our region include the Wyndham Court estate in Southampton (1970, Lyons Israel Ellis) and Powell and Moya’s Grade II*-listed Chichester Festival Theatre (1962). For our inaugural event we explored churches and housing developments in the Southampton area. Individual members are planning a programme of informal tours across the region, so keep checking this website for dates and itineraries. Contact: joint co-ordinators Pauline Mousley and Bobbie Dawson.